The original article, 10 Fast Facts Fibromyalgia is Real, appeared September 17, 2016 on ProHealth. The article continues to garner attention, so with ProHealth’s permission I am sharing the article in its entirety here on The Pained Ink Slayer blog. Those of us who live with fibromyalgia know the pain, cognitive dysfunction, poor sleep quality, and fatigue. We understand and can discuss these things with fellow patients, but when we are confronted with someone who knows very little about FM, we sometimes become tongue-tied. Maybe that’s because fibromyalgia is a complex disorder and fibrofog gets in our way. Maybe we let others play on our vulnerabilities, making us feel insecure about our response. And, maybe we can do better by being prepared with some quick facts. Following are ten fast facts that will allow your tongue to flow freely as it forms the words that prove fibromyalgia is real. 2. 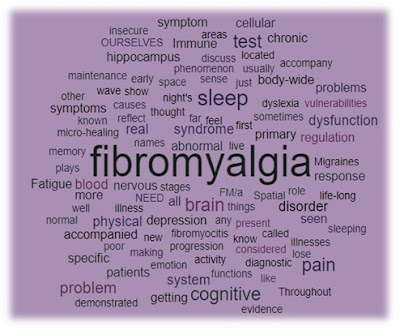 Fibromyalgia is a physical problem that has demonstrated abnormal blood flow in specific areas of the brain (2) and brain scans show unique brain activity (3) in response to pain. 3. The primary, consistent symptom of chronic body-wide pain and tenderness is present in ALL fibro patients, just as the primary symptoms of other illnesses define that syndrome or disease. 5. 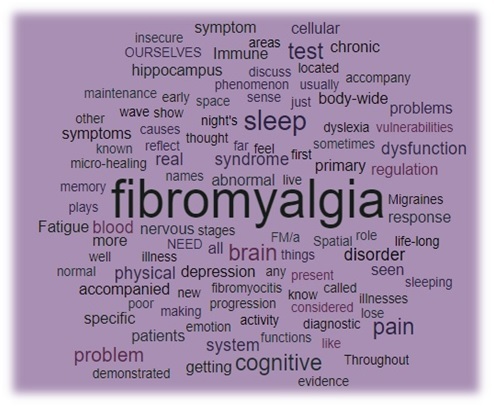 Fibromyalgia is more than not sleeping well for a night or two. It’s like never sleeping at all, and we don’t “bounce back” when we do get eight hours. Because we don’t get normal slow wave sleep progression (6), the healing stages of sleep, the micro-healing that occurs with normal sleep patterns is impaired. This phenomenon could very well explain cellular oxidative stress identified in fibromyalgia. It’s far more than not getting a good night’s sleep for those of us with fibromyalgia. 7. While depression can accompany fibromyalgia or any chronic illness, it is not a primary symptom. Major depression has its own diagnostic criteria. 8. Fibromyalgia is usually accompanied by another disorder. (7) So, when someone tells you no one could have all that wrong, let him or her know that in fact, we can and do. 10.While some believe fibromyalgia is progressive in nature and others do not, fibromyalgia is considered a life-long central nervous system disorder. (9) It is not going away because our friends, many times eager to help, tell us they just read about a miracle cure in some tabloid magazine. I once had a neurologist tell me he would not see me for my migraines, because he didn’t “believe in” fibromyalgia. After I recovered, I simply said, “fibromyalgia is not a belief system, I will not be back.” I was thankful I didn’t “come in like a wrecking ball” like Miley Cyrus and hit him upside the head with my purse. WE DO NOT NEED TO DEFEND OURSELVES FOR HAVING FIBROMYALGIA! I have learned from various encounters that some folks are innocently ignorant and want to know more. For those folks, I spend the time. I have also learned there are closed-minded people who are not worth the effort because they have no intention of listening. If someone makes you defensive, simply reflect their words back to them and change the subject, even if it’s a healthcare provider. We do not need a healthcare provider who is stagnant in a profession that is in a constant state of learning. Give these ten facts to a staff member or leave some copies in the waiting room. They are sure to generate some discussion. Cooper, C. and Miller, J. 2010. Integrative Therapies for Fibromyalgia, Chronic Fatigue Syndrome, and Myofascial Pain: The Mind-Body Connection. Vermont: Healing Arts Press. Guedj E, Cammilleri S, Niboyet J, Dupont P, Vidal E, Dropinski JP, Mundler O. Clinical correlate of brain SPECT perfusion abnormalities in fibromyalgia. J Nucl Med. 2008 Nov;49(11):1798-803. doi: 10.2967/jnumed.108.053264. Epub 2008 Oct 16. Kim J, Loggia ML, Cahalan CM, Harris RE, Beissner F, Garcia RG, Kim H, Barbieri R, Wasan AD, Edwards RR, Napadow V. The somatosensory link in fibromyalgia: functional connectivity of the primary somatosensory cortex is altered by sustained pain and is associated with clinical/autonomic dysfunction. Arthritis Rheumatol. 2015 May. Emad Y, Ragab Y, Zeinhom F, El-Khouly G, Abou-Zeid A, Rasker JJ. Hippocampus dysfunction may explain symptoms of fibromyalgia syndrome. A study with single-voxel magnetic resonance spectroscopy. J Rheumatol. 2008 Jul;35(7):1371-7. Epub 2008 May 15. Ichesco E, Puiu T, Hampson JP, Kairys AE, Clauw DJ, Harte SE, Peltier SJ, Harris RE, Schmidt-Wilcke T. Altered fMRI resting-state connectivity in individuals with fibromyalgia on acute pain stimulation. Eur J Pain. 2016 Aug;20(7):1079-89. doi: 10.1002/ejp.832. Epub 2016 Jan 15. Vijayan S, Klerman EB, Adler GK, Kopell NJ. Thalamic mechanisms underlying alpha-delta sleep with implications for fibromyalgia. J Neurophysiol. 2015 Sep;114(3):1923-30. doi: 10.1152/jn.00280.2015. Epub 2015 Aug 5. Bennett, RM. Pain management in fibromyalgia. Pain Manag. 2016 May;6(4):313-6. doi: 10.2217/pmt-2016-0026. FM/a® Blood Test – “How To” and My Results. June 2016 Blog. Fibromyalgia Has Central Nervous System Origins. American Pain Society, Press Room, May 16, 2015. (Accessed 2016, September 9).